La France is, without a doubt, a wine country. But this big ol’ American likes beer, and I was curious if there were any good French beers to be found. During my weeks in the Rhone-Alpes region, almost all the beer I found was imported from Belgium, with very few French varieties. I stopped in Paris for a few days at the end of my time in France, and I met up with a Parisian friend that I had made months ago, at the Warsaw Beer Festival (further proving my belief that beer brings people together). He showed me what I had been looking for: a French craft beer bar. “La Fine Mousse” has made the news not only for focusing on French beer, but also for copying something normally reserved for French wines: beer-food pairings. With 150 beers avaliable, and friendly “bièreologues” to help you choose, there is no shortage of options. hipster bars back home. Though some of the beers were underwhelming, others were quite good, and it was fun to see an unexpected scene like this in Paris. 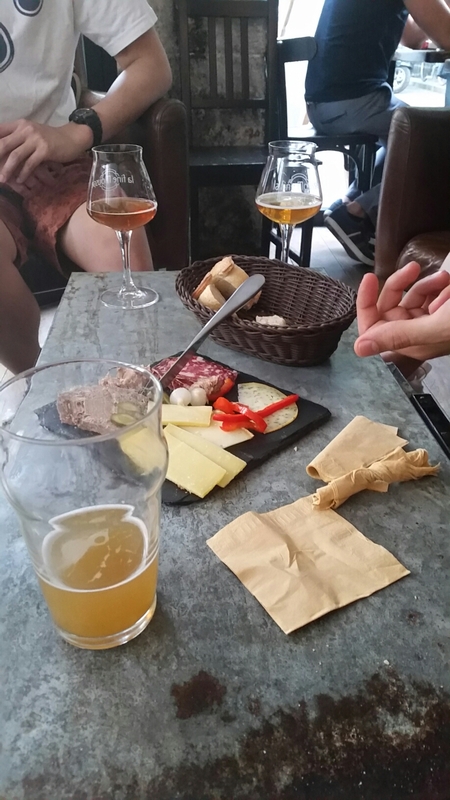 There is a young craft beer scene in France, even if it is hidden by the sheer mass of wine culture. Paris, as they say, will always surprise you. If you love food, the summer is full of celebrations. Each week, there is something new to look forward to. In Wisconsin, I love watching the season pass, tracking when the raspberries are at their sweetest, or how many weeks I can count on fresh peaches. I count the summer weeks by what fruit is most ripe. 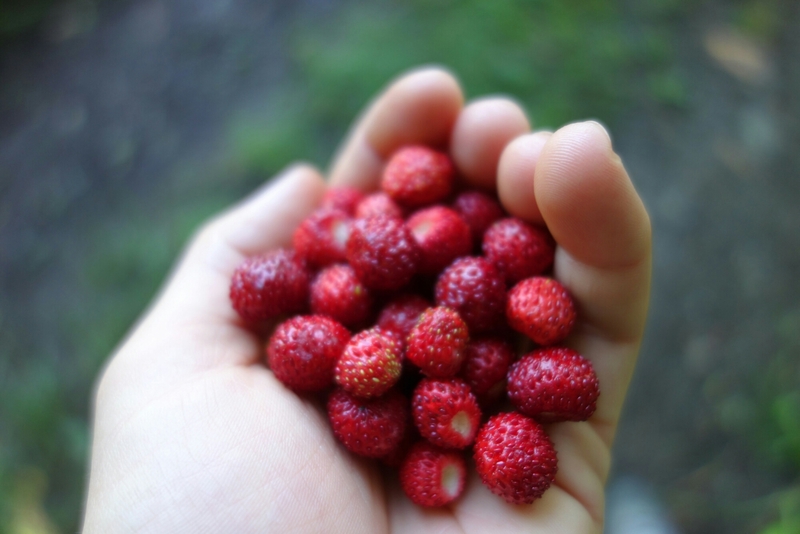 Fresh wild strawberries, found on a walk in the woods. Luckily, with the rain earlier that morning, they were fresh and washed. Now, here in France, I am less familiar with the timing of the season, but I enjoy celebrating the cycle nevertheless. During my stay with Thierry and Annick, there are a few things in particular that are in peak season. 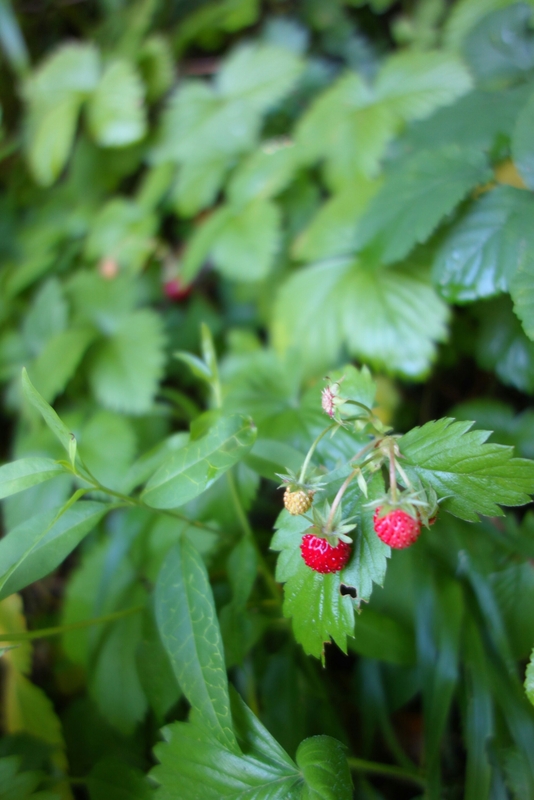 The wild strawberries and raspberries are bountiful, and I harvest them nearly every day. 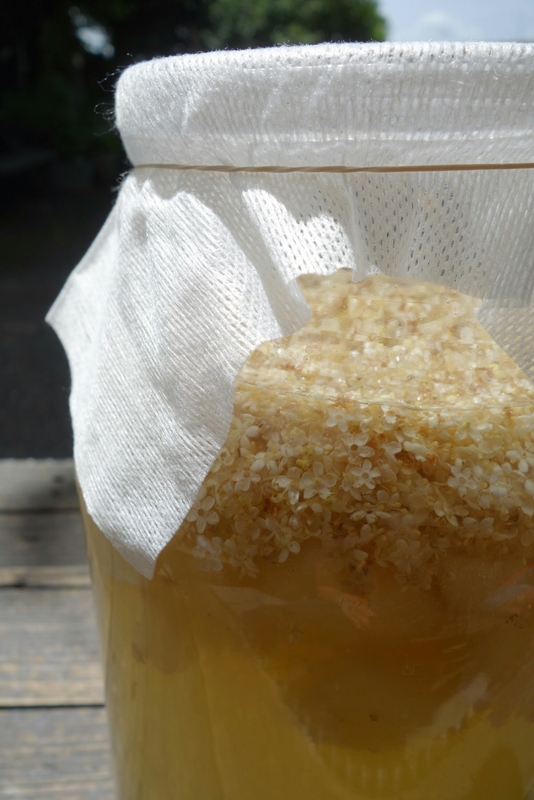 Elderflowers are also blooming, and Annick and I use them to make a pétillant, a naturally fermented drink. 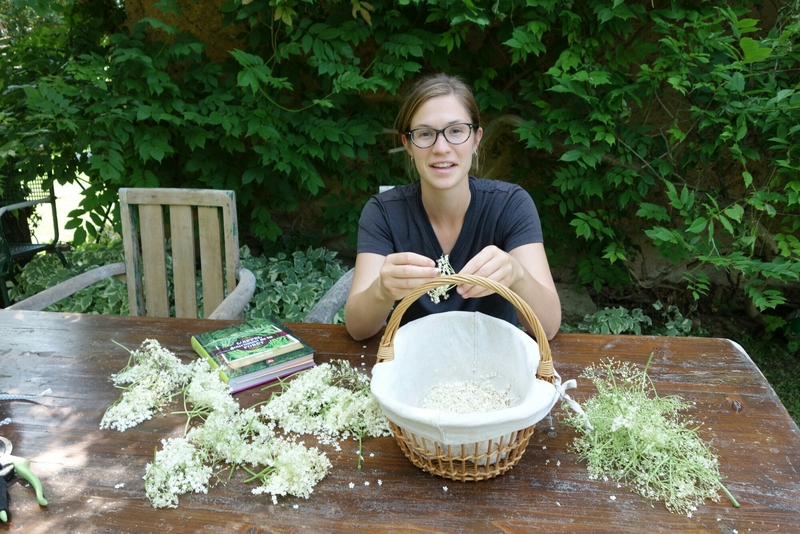 Annick takes a picture of me, as we work to shake loose the blooms of the elderflowers. The elderflowers, combined with lemon and sugar, sit in the sun. Natural yeasts in the air will ferment the infusion, and after a few weeks in the cellar, the pétillant will be ready to drink! And why not celebrate? I savor these summer fruits, made all the sweeter by their short stay. Wild strawberries stained my hands red all week. I didn't mind. Bread in the Oven or the Fire? I confuse a lot of French words. Gare and guerre (train station and war, respectively) tends to be a perennial hilarious mixup (“excuse me sir, is the war this way? I need to catch a train”). I still remember the Polish man who told me that he will never be able to keep straight the difference between chicken and kitchen, and I empathize. Anyone who has learned another language can recount numerous embarrassing stories about misunderstandings and errors. It’s part of the learning process. It also inevitably makes my life full of surprises, as I usually only understand around 85% of what is going on at any given time. It was only later, when she showed me the recipe, that I understood my mistake: not pain au four, but pain au feu- bread over the fire. Suddenly, I became much more excited. The dough, ready to cook over the fire on the branches. 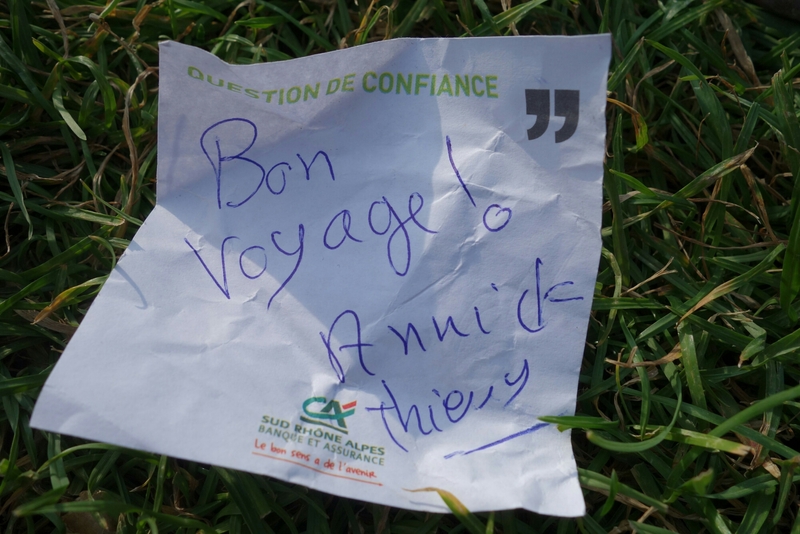 Annick and Thierry, my WWOOF hosts in France, are always up to something. Whether it’s hosting the village open-air cinema, or tromping through the woods to find elderflowers, they stay busy with different projects. Annick has recently been toying around with cooking over an open fire, and she has perfected the pain au feu. We started with a simple dough, and let it rise. I wrapped the dough around a branch and slowly and attentively roasted it. Next to me, the children that Annick watches after school roasted their breads, and I woefully tried to prevent their sticks from dropping into the fire. Annick, wrapping the fresh dough around the stick. Eventually, we all had cooked pain au feu, with various levels of charred bits. We gleefully ate the bread with a bit of cheese and chocolate, enjoying the smokey flavor and crisp outside. Though I’ve always had a high respect for French bread, I’ve now grown even more respect. Even regular bread, cooked in the oven, won’t be enough for me anymore- I’ve discovered pain au feu. I, amused, guard the kid’s bread, when they lose their patience with cooking and start to play instead. and finally, the bread is done! The outside is a beautiful crust, but the inside is still soft dough. Perfect with a piece of chocolate. Upon arriving in Grenoble, a college friend, Patrick, informed me of two Rhone-Alpes specialties that I must try. The first is the la tartiflette, which features the specialty regional cheese, and secondly, la Chartreuse, which is a strong liquor specially made by monks with a secret blend of herbs. However, as the weekend flew by, full of activities and parties, I never found an opportunity to search out these specialties. 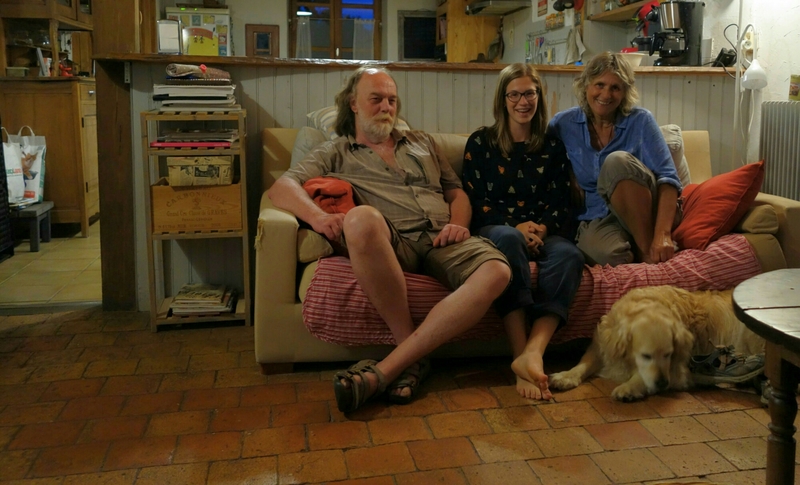 After the weekend, I headed to the countryside, to do WWOOFing work with a family near Lyon. And there, by the second day, I had not only made and tasted la tartiflette, but I had also drunk la Chartreuse. La vie est belle, à la campagne. La tartiflette is made with reblochon cheese, a famous type of cheese from the Alps. The name comes from the French word “reblocher”, which basically means to re-milk a cow. The origin legend claims that cow farmers, back when they had to pay tax on the amount of milk their cows produced, would purposefully only partially milk their cows. Then, after their product was accounted for and taxed, they would return to their cows for a second milking. The second milk has a much higher fat content, and it is with this creamy milk that they made the strong reblochon. The cheese has a strong nutty flavor, one that you can smell from a mile away. La tartiflette is a type of gratin, made with potatoes, onions, and chunks of pork fat. All these are cooked together, in a pan, until well browned. Then, they are combined in a casserole dish, and the round of reblochon cheese is added on top. These ingredients combine in the oven to become a gooey, oozing, beautiful mess of a dish. It is most popular in the winter in the Alps, after you’ve finished skiing and tromping in the snow all day. We, however, ate it at the end of a hot summer day. As my Portuguese friend Catarina would say, after eating la tartiflette, you can’t do anything but roll away from the table. This is comfort food, the meal that leaves you satisfied and wanting a nap. La tartiflette, in its cheesy glory. The original round form of the reblochon can still be seen on top, cut into four pieces. La Chartreuse is the liquor of the Alps, with a long and eventful history. Made by monks since the 1600s, even during periods of their exile, it has become world famous. There is even officially a color, chartreuse, which lies somewhere between yellow and green. The most famous type of Chartreuse, the strong green liquor, is made from reportedly 130 different herbs, and is the “secret elixir for a long life”. Today, only two monks know the exact blend at one time, and they prepare the herbs for each batch. In typical AOC fashion, it is rumored that the two monks never see each other, in case some natural disaster should kill them both at the same time. The flavor of la Chartreuse is strong and herbal, staying in your throat and warming your bones. I drink it the second night with Annick and Thierry, and I feel as if I am tasting the elixir of the Alps. La Chartreuse verte, at 55 percent alcohol. Don’t worry, we didn’t start out the evening with a full bottle. Though it can be a bit overdone to always focus on the “regional specialty”, I find something very beautiful in searching it out. First of all, I truly enjoy how even if people may be embarrassed or roll their eyes when they tell me about their “specialty”, every single person I ask gladly joins me in sharing a plate. Familiar food is still good food. I also find that, over a shared plate, people will frequently share memories about the dish. Stories about holidays, family, or attempts to cook pass back and forth. There is something in a familiar taste that elicits some sense of home, a sort of comfort hidden in the sauce. Cuisines are becoming more global, influenced by styles from around the world. I love that I can see Thai influences in French cooking, or eat a damn good baguette in Tokyo. But these regional specialties, too, add diversity and resilience to a globalized food network. Great cuisines, like French and Japanese for example, celebrate their local products, encouraging local pride and continuation. But for me, I search out these regional specialties for a different reason. In a time when cuisine becomes more and more global, these regional specialties tie us to a place. They help bring us together; they help us remember. When we make and celebrate a special dish, we are acknowledging the long tradition we come from, and creating our place in it. These dishes give us a sense of belonging, if only for a meal. I’ve taken years of French courses, and each year, there is inevitably a lesson titled, “on va au marché!” In this vocabulary lesson, you learn the names of fruits, how to ask for two kilos of tomatoes, and indicate what kind of meat you wish to buy. The lesson always includes a section on the different types of French stores: the boucherie, for different meats, the fromagerie, for cheeses, or the pâtisserie, for pastries. I’ve studied this lesson many times, memorized the vocabulary, and done silly role playing exercises, where we pretend we are in a French market. And yet, here I am in Grenoble, France, standing in front of an actual French cheese vendor, completely blanking on the word for “slice”. Umm… a pile of cheese? “Un petit peu”? Enough for two sandwiches, s’il vous plaît? Eventually, he gets my meaning, and I get my cheese- two tranches de chèvre, fresh and fluffy. The vendor smiles knowingly at me, and I think he’s happy that I’m making an effort. I slink away, repeating to myself, “une tranche… tranche… tranche de fromage”. A real, bona fide French market. How beautiful! Exactly as French as I pictured it. I am lucky to be welcomed in Grenoble by Patrick, a Lawrence University alumni who, despite never having met me before, showed me around the city for the weekend. I happen to arrive during the city’s big festival, La Fête des Tuiles. The festival is named for the famous protest in Grenoble, when citizens took roof tiles, or tuiles, off their own houses and threw them at the marching parade of the army. This was one of the starts of the French Revolution. Today, we celebrate their rebellion with food and music. What better way to honor the revolutionaries? It’s been a few years since I was in a French speaking country, but the language is starting to come back to me. After a few drinks at la Fête des Tuiles, I find my tongue loosening, fitting better into those French vowels and the dreaded French “r”. If only I could adapt as easily to the accent as I have to the wine. La Fete des Tuiles, à Grenoble! Though I spent many months in Sénégal, a francophone country, it’s fun to finally be in France too. I spent years in French courses, reading books and small cultural anecdotes about this country. Now I’m here, taking the TGV and seeing that, truly, a large percentage of people have a baguette in their bag at any given time. I’m excited to finally see this country for myself, to talk to the people here, to learn this accent and this slang. But let’s be honest- I’m really just here for the cheese. And now that I can proficiently order what I want, let the culinary exploration begin. Une tranche de fromage, s’il vous plaît! Though I have been traveling for a while, I have not yet forgotten my home, my natural habitat- the flat, corn-filled plains of the American Midwest. As my travels continue on, and the end of my trip is in my sight, I think about home often. It was not difficult to adapt to this climate. Korčula is one of a string of islands along the Dalmatian coast, with a long and eventful history. For thousands of years, a series of peoples, from the Illyrians to the Romans to the Byzantines, then to Slavic peoples and Venetian rulers and others in between, called the island home. Today, as part of Croatia, the relatively densely populated island is an increasingly busy hub along the Dalmatian coast. The long habitation on the island is obvious. One of the most visible old technologies is the dry stone walls that line many roads and form hillside terraces all over the island. These stones have been dug up from the island’s topsoil for thousands of years, and they serve a dual purpose. Firstly, the farmers needed to remove the stones from the soil to grow their crops. And secondly, the walls that form terraced fields help keep the invaluable island topsoil from washing into the sea. The same rock was used to build old houses and sheds. Korčula is rocky. The beaches are covered with white rock, coarse limestone and dolomite, instead of fine sand. All over Maja’s land, this rock sticks out of the earth, and at certain points the top soil is only a few inches deep. The formation of the island has even made fresh water reservoirs historically unreliable, and sea water intrusion into aquifers remains a threat today. Until fresh water started being pumped in from the mainland in the late 20th century, water was difficult to use for agriculture. Even today, little of the farmland on Korcula is irrigated. Emily and Reece walking Cleo through a small village, where we stopped to eat our lunch. Notice the stones used to build these old buildings, some of which are still in use. The view of the peninsula town of Korcula, on the island of Korcula. The white stone gives the town its distinct aesthetic. All of these factors affect Korčula’s agriculture. When I think about my own home, the “breadbasket” of the United States, it becomes more and more apparent how well suited it is for massive industrialized agriculture. With relatively thick top soil, flat prairie land, a low population density, and an abundance of fresh water, the soil was fertile for the miles and miles of intensive grain and corn farming that spread today. On an island like Korčula, that sort of industrialized agriculture is simply not possible. The landscape will not allow it. Small plots of land are broken up by rocky outcrops, and most of the land contains various sized boulders. Small, old villages are scattered throughout the farmland. And an island ecosystem is no place for intensive crop production; the topsoil does not regenerate as fast. Instead, small commercial farms are kept small, and the crops grown remain limited. These environmental factors, among the certainly complicated cultural and political systems, influence the type of agriculture found on Korčula today. As I try to make sense of what I find in my own home, and what I find elsewhere, the history of these systems becomes more important to me. Nothing, especially food, exists in a vacuum. Cuisine, everywhere, is inextricably linked to its environment, but island cuisine is even more particular. In the times before hourly ferries and cheap island supermarkets, most people ate almost entirely what was available on this 280 square kilometer (110 square mile) stretch of land. This meant that Korčula’s cuisine has relied on a few staples that are still very present on the island today. Fish and other seafood, of course, was the main protein. Without enough room for big animals like cows or pigs, the only common domesticated mammal was a donkey, which was used for transport. Grapes and olives grew all over the island, but the farmers today will tell you that there are many microclimates on the island that are difficult to guess. Some plot will grow the best white wine grapes you’ve ever tasted, and half a kilometer away the grapes will fail. Nonetheless, wine making and olives remain integral to the island. These plants grow well in the rocky soil. One day, Maja asked us if we wanted to eat the classic comfort food of Korčula, like her grandparents used to eat. The dish is a mix of semi mashed potatoes, a sort of chard, and olive oil and salt. Though it could not be simpler, it also could not be more delicious. It shares the appeal of macaroni and cheese for many Americans- it is warm, filling, and you want to cuddle up and take a nap after eating it. This dish is also made entirely with ingredients from the island: the potatoes are grown and stored, the chard is foraged, and the olive oil is pressed from the olive crop. Comfort food, à la Korčula island. A salad featuring olives and octopus, absolutely fresh and delicious! The last night on the island, we celebrate the birthday of Reece, one of the other workers. This celebration involves a beautiful fish dinner and too many glasses of a fennel based liquor, but the night was certainly memorable. We shared grilled fish, steamed and fried vegetables, and olives and local cheese. Nothing could have been a more appropriate goodbye, and nothing could have been more like the island of Korčula: good food, good liquor, and good company, all overlooking the beautiful sea. I had to end my post about Croatia with one of my favorite pictures- the beautiful Cleo, who is the color of Croatia, looking at me on our last beach visit. Reece is in the background. No more beautiful place to say goodbye! I was lost, listless, after my visit with my mother. Where to go next, on this big continent? What soil to search out; what food to eat, what climate to sweat in? Whenever I’ve been at a crossroads on this trip, some wayward breeze pushes me in a new direction. An American friend named Emily, who had worked on Iulia’s WWOOF farm with me in Romania, emailed me to catch up. She was in Croatia, helping a Croatian woman named Maja start work on some newly-acquired land. She told me I should come, and without hesitation, I bought my ticket. Soon, I was in a tiny apartment in Split, Croatia, with Emily, Maja, and two crazy dogs. Everything smelled like a combination of coffee and essential oils. These wayward breezes always lead me somewhere interesting. I arrived in Korcula from a ferry, and this was my first view of the island. Unreal! Maja owns the beginning of an organic cosmetics empire in Croatia. She makes all of the cosmetics herself, toying with the recipes to produce what she herself would use. Her face creams, lotions, oils, soaps, and cleansers are infused with different herbs and plants. All of them contain only natural ingredients; in Maja’s words, “you can eat them. They probably won’t taste good, but you could eat them”. Her first shop is a successful establishment on the island of Korčula, selling to the hordes of mainland and yachting tourists. I have immense respect for those who own well-run small businesses (Pom and U also come to mind). As Emily and I spent a few days helping Maja open for the summer season, I was continually surprised at how much Maja could accomplish in a day. Even when it looked impossible, she would somehow find a way to surprise everyone. In her own words, “before I opened my own business, I was a baby. Then, I had to become a witch”. When the final responsibility lies with Maja, she develops a sometimes haphazard but superhuman productivity. I loved watching her work in her store. Her success lies somewhere between her good product, and her personal ability to convince you that you’ve been searching for it your entire life. Maja is also one of the rare types that is always looking ahead, to guarantee the health of her business. She saw an opportunity to diversify her business, and she took it. This is why Emily, an herbal expert, and I, someone who likes to dig in the dirt, were in Croatia: Maja had bought some land. Maja and I, getting a drink in town before dinner. This woman gave me more good life advice than I know what to do with. The plot that Maja had bought had previously been a young olive orchard. But the many “micro climates” on diverse islands like Korcula doomed the finicky olive trees, and the land was left fallow. Fallow lands grows surprises. We planned a few things for “the land”, as we called it. First, Maja wanted to be growing her own herbs for her cosmetics. St John’s Wort and rosemary, two of the herbs she used, were already growing wild on the land, but she wanted more focused cultivation of all of the herbs she used. Maja also wanted to grow fruits and vegetables for herself, using principles of permaculture. Finally, with the leftover space, she planned to create a “glamour camping” site. With Korčula becoming a bigger and bigger tourist destination, unique accommodation, like a camping site tucked away in the middle of the island, is a good investment. With all this in mind, I was excited to see the land and start working. But the first time we visited the land, I couldn’t look at or think about anything but the blackberry wall. A former compost pile had given birth to a wild blackberry thicket as big as many houses, blocking a large part of the front piece of the land. They grew bigger every day it grew warmer, and we wanted to remove them as soon as possible to start bigger reshaping of the land. Emily is walking through the center part of the land. To the left, there are piles of cut blackberries. Emily, again, covered up and chopping blackberries. She did it in shorts- highly unadvisable, unless you have cold salt water to swim in after working. For anyone who has never had the experience of untangling wild blackberry branches, I highly recommend it. You’ll need clothes you don’t mind being torn apart by thorns, a machete to hack through the top layers, a rake to haul away the spiny branches, and a heavy duty hoe for the extensive root system. If you have any appointments, cancel them. This will take longer than expected. Make sure you are well rested and fed, to be able to concentrate on the mess without chopping a finger off or sticking yourself in the eye with a thorn (on second thought maybe protective eyegear is also advised). And finally, only work with people you trust. When tools and long branches of thorns are being thrown around, you want to make sure you are working with good people. A week of solid work, and many thorn-inspired curse words later, we had completed the biggest section. The first and most urgent task was finished, for now. The rest of the work could begin. After we celebrated with an afternoon at the beach, of course. There is something very special about helping start a farm. You know that a lot of your work is going to be seen as a milestone, as “the first _____”. And nothing could be better than watching Maja plant her first plant. At the beginning of the season, Maja was very busy at her store, and we had the independence to set our own agenda and work hours. Clearing the invasive blackberries and generally cleaning the land took up most of our time, but with the approaching end of our time in Korčula, we wanted to finish one last project: the first garden bed. Emily, Reece, an Australian, and I worked hard, finishing the garden bed on one of the last days. We hoed up a section of the bed, layered different organic materials and compost, and built a stone wall to enclose it. Excited to start filling the bed, we brought a few transplants to the land, and with Maja, we planted. We all took a moment to celebrate- our first plants on this land, our first attempt to farm here. Though, undoubtedly, Maja’s land and goals will change as she moves along and learns, I still love celebrating milestones like these. They are important, to keep you motivated and looking ahead. As I watched Maja smile, her hands in the soil and probably already planning her next project, I smiled too. I felt to so lucky to be drawn here for these few weeks, to see the development of the land. I felt utterly content. I looked down and spy a small blackberry plant, next to my sandal. Maja, planting her first transplant in the new bed. All of us, after we finished the first bed. We are tired but happy, content to have finished this big project. Cleo looks happiest of all.